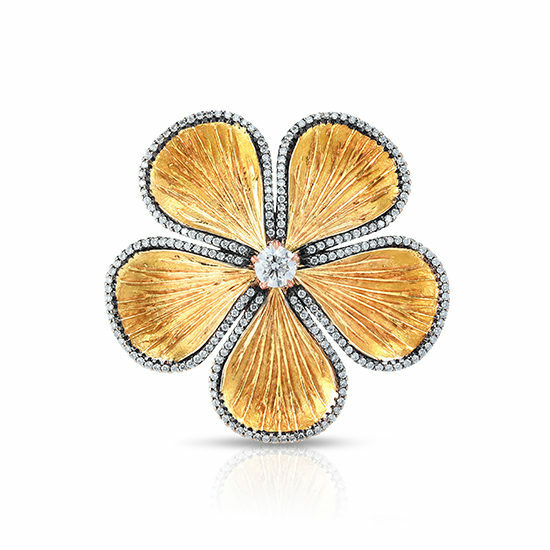 Designer Douglas Elliott created this flower ring as a special surprise for his wife Marisa Perry as a birthday gift. The original was hand carved by a master jeweler and made in 20k yellow gold, giving it a rich orangy color. The edges of the petals are finished with handset diamond micro pave – the brilliant sparkle of the diamonds contrast the black rhodium plating at the petals’ edges. The center stone selected for this ring is a 45 point diamond. The original ring is one of a kind and can be shown upon request. This ring can be customized with Sapphire or Ruby micro pave or center stone. Also available as a hand carved original piece in the metal of your choosing.